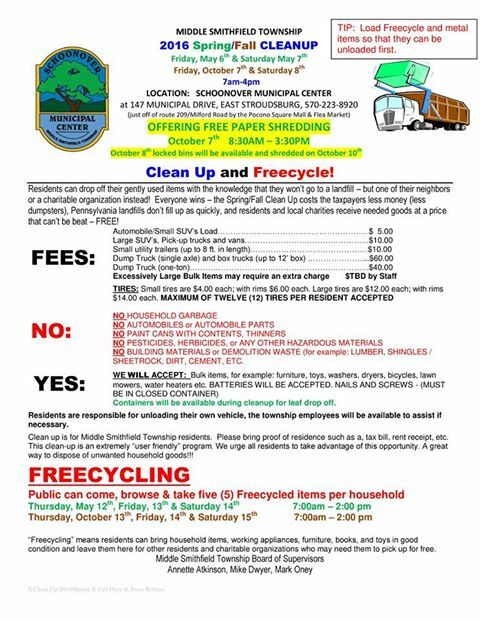 Middle Smithfield Township’s annual Fall Clean Up will be on October 7th and 8th from 7am-4pm, during which Freecycle items will be accepted. Also, DES Community Partners Recycling will be on site October 7th from 8:30am-3:30pm offering free paper shredding. Our Freecycle Pick Up Event will be on October 13th, 14th and 15th. Residents can drop off their gently used items with the knowledge that they won’t go to a landfill – but one of their neighbors or a charitable organization instead! Everyone wins – The Fall Clean Up costs the taxpayers less money, Pennsylvania landfills don’t fill up as quickly, and residents and local charities receive needed goods at a price that can’t be beat – FREE!